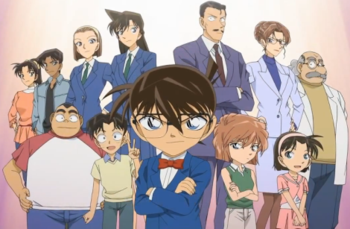 0 Detective Conan episode 96B: Caught Up with the Great Detective! 2 Murder Cases! Episode 96B: Caught Up with the Great Detective! 2 Murder Cases! Scenario: After affirming Yorkham's identity through his writing which matches an old letter, Conan notices a man in a trench-coat hiding around the mansion. That night, Hiedy's step mother is found dead in a water well holding a camellia in her right hand; It was the same way Hiedy's biological mother died. 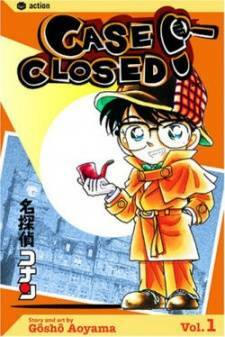 The police are called to investigate while Conan attempts to discern who the murderer is. The police find the step mother's car in the forest with the key in the emission and a cassette tape missing. The next day, during the hearing of the will, an arrow is fired from a timed crossbow directed at Yorkham who manages to avoid it. A police officer reveals that he found a cassette tape near the bathroom and that the fingerprints on the knife reveal that the step mother was holding the knife outwards. They discover the cassette contained the sounds of a party giving Conan an epiphany. Conan tranquilizes Detective Magnum and reveals that Kari Xanderbilt was the one who prepared the crossbow, evidenced by her statement which reveals she knew an arrow was shot from a cabinet. Kari confesses revealing that she was in heavy debt. Conan then reveals that the step mother used the cassette to forge an alibi to make it seem as if she was at the party, and had planned to murder Yorkham to increase her share of the inheritance. The camellia flower was to link the crime to their biological mother's death to add to the confusion. Yorkham, skilled in Brazilian Jiu-Jitsu, deflects the knife and killed her unintentionally in self defense. Conan deduces that Yorkham had received two threats, one from Kari and one from the step mother, and had placed the body in the well as a warning to the second killer. The disguised man then enters the room revealing himself to be Jimmy's father, Booker Kudo, who reveals that Yorkham placed the body there so it could be found to test the Detective's skills. Yorkham, who realized that Magnum was an idiot, kept it a secret about what had happened and the two threats. Booker then reveals that the man is not Yorkham and that he was a bodyguard for Carlos who is the son of the real Yorkham. He further elaborates explaining the man had been writing letters for the real Yorkham since Yorkham lost his left hand, evidenced by letters Booker found in the storage room. Later, Booker and Vivian return Conan to the Moore's resident before returning home.